I usually pick books that I have recommended in Show Me How! Build Your Child’s Self-Esteem Through Reading, Crafting and Cooking. If you click on the link, you will visit the wonderful blog of Kimberley Moran’s First in Maine. This former preschool teacher did a lovely review of my book yesterday. I know it’s hard to think about the gift-giving holidays of winter when we are just entering these scarlet and gold days of autumn…but Christmas and Hanukkah and Kwanza will be here before we know it. If you are needing a great gift for a teacher, parent or grandparent of young kids, a daycare provider or anyone who loves reading, crafting and cooking with children…or anyone who might be a little hesitant about doing activities with kids, please direct them to my website. They can grab a copy of this award-winning resource that makes planning fun-filled educational self-esteem building activities a snap…and we are offering FREE SHIPPING and a small BONUS gift for the next 30 days! THIS IS A GIFT THAT REQUIRES NO BATTERIES…IT’S POWERED BY A CHILD’S IMAGINATION AND A PARENT’S POSITIVE PARTICIPATION! Young children are often beset with many different fears: fear of the dark and going to sleep, fear of monsters, fear of separation and getting lost, fear of new experiences and new places and fear of illness and death. Do you have a young child who is afraid of something? Is that fear keeping him or her from joining activities or socializing? Sitting down and talking to your child is a good step to take to try to help your child overcome that fear. But sometimes it’s hard to start a conversation about difficult topics. That’s why picture books are so valuable because they set the stage for a relaxed discussion about almost anything. 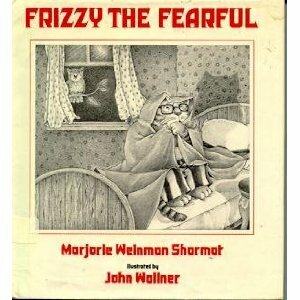 For this situation,a wonderful choice would be Frizzy The Fearful by Marjorie Weinman Sharmat. This little tiger is afraid of EVERYTHING, but with the help of his friends and mother, he learns that he can cope with those fears. Poor little Frizzy Tiger! He is afraid of almost everything…high places and low places, the dark, loud noises and pits in fruit. He avoids going places with his friends and misses out on many fun-filled activities because he doesn’t want anyone to know how frightened he is. When he climbs a tree to help a friend, even though he is terrified, Frizzy realizes that everyone has fears, and he begins to feel a little better about his own situation. Children love to hear about others who have experiences and feelings similar to their own. This is a wonderful book to share with any child, but especially one who has some fears…Frizzy Tiger has so many. Young kids will be able to relate to the little tiger and will cheer him on, hopefully acknowledging and perhaps overcoming their own fears as they do so. The illustrations keep pace with the text and will help a young listener identify with the many situations that frighten Frizzy. During the story or afterwards, the adult reader will have a great opportunity to listen with respect to what the child has to say. Perhaps sharing an experience from your own childhood will also help the child understand that everyone has fears. Here’s a quick and easy craft project that any young child would love to make. Perhaps your child has been to the dentist and was very brave in the chair…or maybe she finished her first week of nursery school and even though she was hesitant at first, she has made the adjustment and is enjoying her day there. 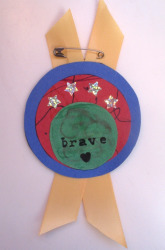 Pin this badge on to affirm his willingness to overcome his fears and his acceptance of life’s challenges. You will need: Construction paper, aluminum foil, glue stick, ribbon, scissors, crayons or markers and one safety pin. 1. Cut out 3 circles of different sizes. 2. Glue the circles, one on top of the other. 3. Glue the ribbon on the back. 4. Write the child’s name on the smallest circle. Cooking with kids is another great way to extend the learning experience that starts with reading the book. Here’s a simple fruit salad that is a nutritious snack or lunch. We all know how important it is to encourage young children to eat healthy foods. We need to make every meal count…especially snacks! You will need: 1 banana, a small bunch of seedless grapes, 1 pear, 1 navel orange and a few leaes of lettuce to use as the base. You can substitute any fruits your child enjoys…just try to add one or two new ones that he can try. 1. Wash all the fruit and lettuce and put the lettuce leaves in the bowls. 2. Slice the apple and pear and arrange on the lettuce. 3. Peel the orange, separate into sections and arrange on the plate. 4. Peel the banana, slice and add to the arrangement. 5. Cut each grape in half and add to the salad. 6. Serves 2-3 as a main dish (add some grilled chicken strips or cheese cubes for protein). Serves 4-6 as a side salad or snack (add a couple of whole grain crackers). The Show-Me-How School Initiative is still looking for A FEW GOOD SCHOOLS. Please leave a comment on this post, telling which school or other child-care facility you would like to nominate to receive a free copy of Show Me How! And please don’t forget to visit my website for a chance to get a copy of Show Me How!…FREE SHIPPING AND A FREE BONUS GIFT FOR THE NEXT 30 DAYS!!! This entry was posted in Cooking with children, Coping with Fears, Crafting with Children, Perfect Picture Book Friday, Show Me How! School Initiative and tagged children, Marjorie W. Sharmat, overcoming fear, Picture book, self esteem building activities, Susanna Leonard Hill by viviankirkfield. Bookmark the permalink. This sounds great, Vivian. I’m glad they were both scared but one overcame it. Kids always think you’re either not scared or scared. Being brave is so important. That book sounds really good. I’ll have to check my library for it. Unfortunately my library doesn’t have it. But we’ve read a few books about fears and it’s true they are very comforting. Your activities are always so wonderful for your reviews. Love this choice about fear — an emotion experienced universally. Great message. Vivian- I love your review and the medal craft. What a great idea! I’m going to do that with my kids soon. My son in particular loves medals and awards. Whenever he writes a book of his own, he always draws a medal on the cover (like the Caldecott medal). It’s very cute. But I love the idea of working on a badge. As always, an excellent choice from you, Vivian, and I love the bravery medal craft! I was a very fearful child — a book like this would have helped me, I’m sure. This book sounds wonderful! And, as always, I am so impressed with your activities. I am sort of craft-impaired so I always appreciate ideas that are easy to execute! Thanks so much for sharing, Vivian! What a wonderful book. I can relate as I was also very shy and nervous as a kid. There were not many encouraging stories around then. Love your craft idea. So cool!